2014 has been a year of anniversaries, and accompanying exhibitions to go with many of them. And curiously, from the centenary of the outbreak of World War One to the tercentenary of the ascension of the Hanoverian dynasty to the British throne (the start of the Georgian era), several of these anniversaries have involved Britain and Germany. And it just so happened that I paid a visit to the British Museum’s Germany: Memories of a Nation on the day that was simultaneously remembrance Sunday and the twenty-fifth anniversary of the fall of the Berlin Wall. So 2014. The British Museum are marking a quarter-century of Germany unification with both an exhibition and an accompanying BBC Radio 4 series, written and presented by the museum’s director – and expert on all things German – Neil McGregor. In some ways this review is, in fact, a double review, for my enjoyment of the exhibition was very much enriched by my prior listening to the radio series. McGregor’s insights into Germany and Germany history are based on individual objects that feature in the exhibition, and manage to be incredibly dense whilst at the same time satisfyingly bite-sized, at just fifteen minutes per episode. Whether you listen to all thirty, or just one or two, or whether you even visit the exhibition or not, it is well worth giving them a go. This is not the first time that the British Museum have tried the accompanying-radio-show format. In my opinion, with the 2012 exhibition Shakespeare: Staging the World, a visitor’s ability to make sense of what was an enormous amount of artefacts, relating to not just Shakespeare’s own time but other historical periods as well, was absolutely dependent on having first heard the radio series. The objects that I had learned all about beforehand leapt out at me, demanded my attention, and took on a whole new level of fascination. But most of the other objects, which all had rather tenuous links to Shakespeare or his works, just seemed to come and go in somewhat haphazard, and rather overwhelming, procession. By contrast, Germany: Memories of a Nation holds together as a narrative far better, and the objects are both interesting enough, and their context appropriate enough, for the exhibition to be enjoyed without hearing the radio series. Probably. The most educational part about the exhibition, and indeed the most enjoyable, is how it kept bringing the visitor back to the notion of what Germany is, and who the Germans are. Whatever the object, and whatever period of history it comes from, the exhibition brilliantly explains how it plays a part in defining Germany, and why it resonates with today’s Germans. The fabulous metalworks from the sixteenth and seventeenth centuries, that first set that legendarily high bar for German manufacturing, for instance. The British maker of one sword has even tried to pretend it is German-made by engraving ‘made in Solingen’ on it, perhaps to make a potential buyer pay a higher price! Then there is the iron cross, a military honour created by the King of Prussia in 1807. Friedrich Wilhelm III chose to make the decoration from iron because the kingdom’s ongoing wars against Napoleon were making expensive metals like gold and silver a lot less practical, and because iron – simple and strong – stood for Prussian (and later German) resolve and resilience. 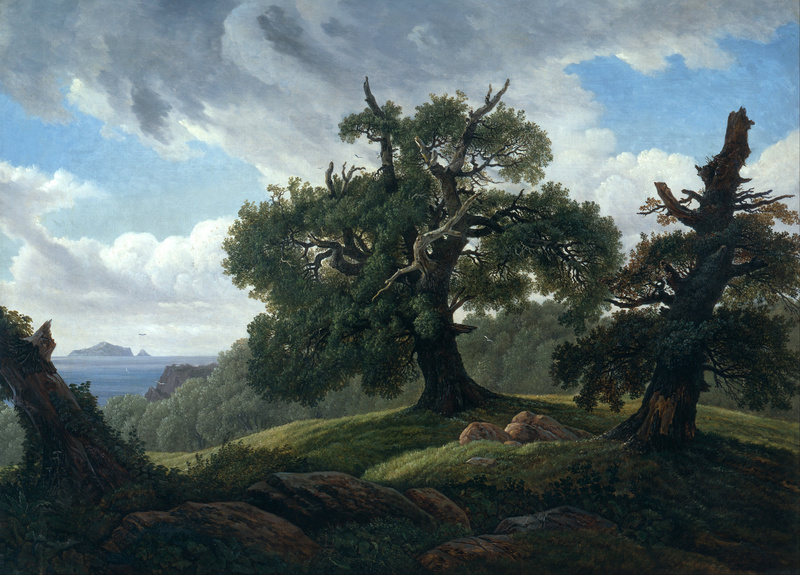 And the oak trees in Carl Gustav Carus’s landscape painting Eichen am Meer, painted in the post-Napoleonic era, look battered and damaged, but are still standing proud as the sun breaks through the cloudy sky, reflecting how many Germans felt after the French finally retreated. And while there are several references to how Germany set about constructing its own mythology by harking back to figures from the distant past (largely thanks to Richard Wagner’s operas), it is a shame that there is virtually nothing on display from before the fifteenth century. 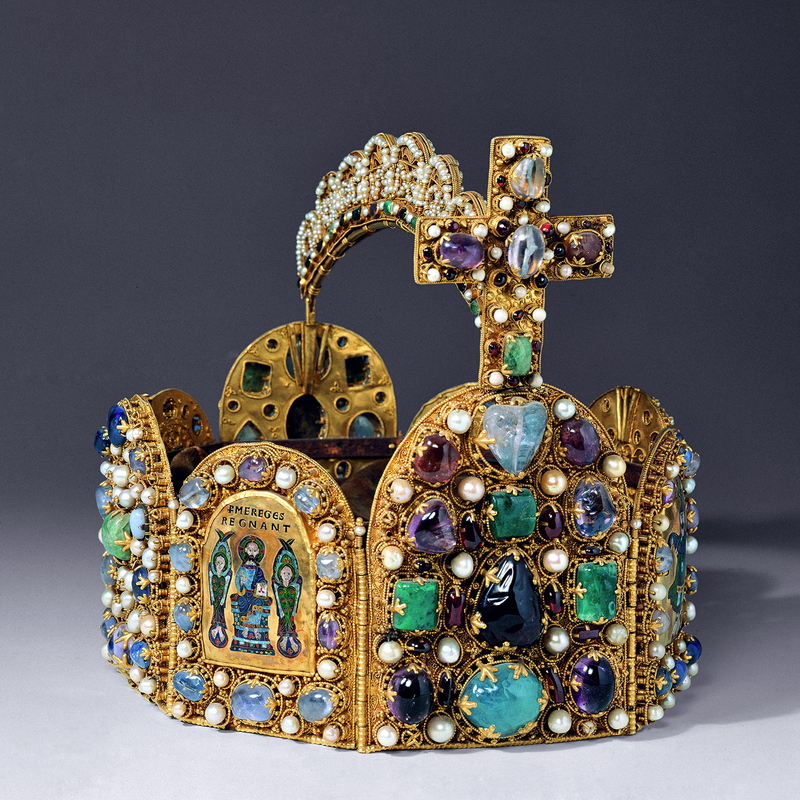 Especially given how fascinating the radio show about the crown of Charlemagne is. Even Hermann (also known as Arminius), the Germanic leader who defeated a Roman army in Tuetoburg Forest in 9AD, gets only a passing mention. As Wagner and his contemporaries discovered, defining German-ness is a complicated business, and looking back into the past makes the task not easier, but a great deal harder. King Ludwig I of Bavaria went for the broadest of all definitions when building the Walhalla, his hall-of-fame of great Germans, by including all speakers of Germanic dialects. Several Dutchmen, Swiss and even King Alfred the Great of the Anglo-Saxons found their way in to Ludwig’s Bavarian Parthenon. Germany did not come into existence as a single nation state until the late 19th century. Before that, the German-speaking parts of central Europe consisted of a patchwork of kingdoms, principalities, duchies and city-states that, between 962 and 1806, formed the Holy Roman Empire. The Empire’s borders were in a constant state of flux over the centuries, as illustrated by the exhibition’s steady succession of maps. Holy Roman Emperors did not simply inherit their title, but had to be appointed by a committee made up of the most powerful princes, dukes, and other rulers, known as the electors. Many electors were simultaneously kings or dukes of lands outside of the Holy Roman Empire, like Hungary or Poland (or in the case of the Electors of Hanover from 1714, Great Britain). And to make matters even more confusing, some German-speaking cities, such as Königsberg (home city of Emmanuel Kant, now Kaliningrad in Russia), were not part of the Holy Roman Empire, while some German states – like Austria – comprised territory both inside and outside of the empire. As the map made up of the Empire’s vast number of different coins show, there’s no doubt that the Holy Roman Empire was a complicated entity which must have baffled foreign visitors, and yet it managed to function, effectively and harmoniously, for nearly a millennia. To put it another way, it was German, and so, it worked. One of my favourite objects in the exhibition was one which represented this complex yet harmonious setup. A mechanical model ship, made probably for the Elector of Saxony in the 1580s, where the figure of the Holy Roman Emperor sits on a throne dressed in imperial robes, while a procession of his electors walk around him in a circle, bowing to him as they pass (though you don’t get to see it in action, unfortunately). When it came to manufacturing and engineering, it was the fragmented, scattered power structure of the Holy Roman Empire that ensured a level of competitiveness between each of its component states that was unique in Europe, and encouraged each duke, prince or king to generously patronise industries, along with science and the arts. It was a group of scientists working for the brilliantly named Augustus the Strong, Elector of Saxony (and King of Poland) who became the first Europeans to figure out how to make porcelain. Their early efforts were made as Chinese-looking as possible, to resemble the kind of objects that had been being imported to Europe for centuries, but very quickly a European style was adopted. After seeing so much Chinese porcelain the other week, the porcelain depiction of two 18th-century white men examining a globe looked almost tacky, but it was charming all the same. Arguably the greatest ever triumph of German craftsmanship, Johannes Gutenberg’s printing press, was bound to make a considerable impact on world history, regardless of what country its inventor originated from. But once again the unique political structure of the Holy Roman Empire played a huge part in just how swiftly books were able to be produced and widely circulated. And as this great educator of the masses, informer of the people, and spreader of ideas was first unleashed on the world, there was no central governing body that had the power to do anything to suppress it. Within fifty years of the first edition of the Gutenberg bible, printing presses in some 350 cities across Europe had produced an estimated nine million volumes of thirty-thousand different titles. One of the original Gutenberg bibles, the first mass-produced book in history, is on display, one of only forty-eight that survive. In a similar vein, the Holy Roman Emperor was also powerless to contain the unstoppable force that was the reformation. When Martin Luther was declared a heretic by the Emperor, and excommunicated by the Pope, he simply sought refuge in one of the many German states that had converted to the new faith. It says a lot about the Holy Roman Empire that even with many of its states converting to Protestantism and many more remaining Catholic, it would survive the religious turmoil of the sixteenth and seventeenth centuries, and the devastating destruction of the Thirty Years’ War. And it was not just Luther’s religious ideas that spread quickly thanks to power of the printed word. In the exhibition is another bible, produced by Luther, and featuring his own handwritten note on the title page. First published in 1522, the crucial difference between it and Gutenberg’s is that it is written not in Latin, but in German. A man well-travelled within the German-speaking lands, Luther had carefully and meticulously crafted a text that could be read and understood by speakers of all Germany’s many dialects, while simultaneously giving the word of God adequate gravitas. It is, for the most part, the German still spoken by virtually all Germans today. Printing brought not just the printed word to the masses, but also a new form of art. Albrecht Dührer became the most skilled copper-engraver of the period and, probably, the greatest of all time. 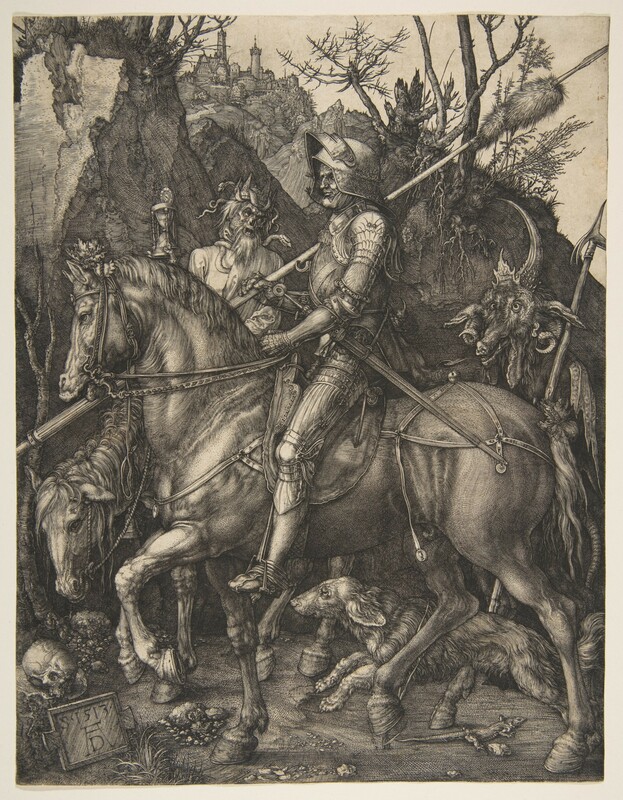 Two of his legendary prints are on display, Knight, Death and the Devil from 1513 and Melencolia I from 1514. Both run rich with symbolism, so much so that it is thought that they are the most written-about and analysed prints in history, but the exquisite detail of the prints is enough on its own to make them incredibly impressive. As is the massive Maximilian Arch – not actually part of the exhibition but on display elsewhere in the British Museum – comprising a series of Dührer prints stuck together to form a stupendously decorated processional arch that was designed, but never actually built, for Emperor Maximilian I. The 20th-century section of the more-or-less chronological exhibition feels a little rushed, or perhaps I just found it less interesting. The world wars, the rise of the Nazis and the Berlin Wall, are all concepts with which virtually all of us in Britain are already familiar (dare I say it, perhaps even tired of) so I can certainly understand the exhibition’s desire to tell us a different, less familiar story and furnish us with a more complete picture of German history. But the blank space and its accompanying text, which declares that the darkest part of German history, the Holocaust, simply cannot be adequately expressed or made sense of, feels like something of a copout. The refugee cart, meanwhile, serves as a poignant reminder of how so many German people, whether fleeing the advancing Russian army, rebuilding their wrecked cities or dealing with the loss of loved ones, suffered terribly in the final stages of the Second World War. A few other items which could have served to shift my perspective on the conflict in this way, however small, would have been most welcome. There were two objects from the first world war that did catch my eye. 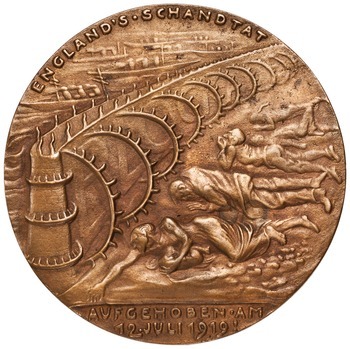 One was incredibly small, a coin showing nightmarish, skeletal figures left starving by the British naval blockade (a decisive factor in the eventual Allied victory, but at a huge civilian cost). The other was one of the largest in the exhibition, usually displayed in Güstrow Cathedral but generously loaned to the British Museum. Ernst Barlach’s World War One memorial Der Schwebende (‘the Hovering’) is a bronze figure, with the face of a woman, representing the mothers of Germany that had lost so many sons, husbands and fathers in the war, her eyes closed in quiet, contemplative grief. Strangely, it does not stand upright, but hangs from the ceiling, suspended just above head height, which has the effect of the figure seeming like she is an angel flying above you, or perhaps a ghost haunting you. This also has the effect of her face being very close to yours, demanding your attention. In every conceivable way, it is as different to Britain’s World War One memorials as you could get. Personally, I found it far more arresting and thought-provoking than our handsome uniformed soldiers with their heads bowed. Its simple message about the futility of war was so effective and so direct that Hitler, of course, loathed it. The Nazis had it removed from Güstrow Cathedral and melted down, but fortunately, some friends of Ernst Barlach had made a cast of the sculpture, which they used to make a second version, hung in Anotiner Church in Cologne after the end of the Second World War. Finally, in the 1950s, a third version was made, and gifted by Cologne (West Germany) to Güstrow (East Germany) as a gesture of friendship between the two Germanies that now existed. And there you have it – Germany’s twentieth century history encapsulated in one object. There’s no interactive elements, or touch screens, or sounds or funky lighting in Memories of a Nation. Aside from some footage of Berliners pouring over the Berlin Wall in 1989 at the very beginning, there is no video or film. Basically, it’s an old-fashioned exhibition, with objects to look act and accompanying text, with an audio guide if you wish. If you are looking for an exhibition that does a little bit more to immerse, or has a bit more spectacle, then you might not enjoy this one. Though, give one or two of Neil McGregor’s radio shows a listen, and you may find yourself irresistibly drawn to it. Germany: Memories of a Nation runs at the British Museum until 25 January 2015. Tickets cost £10 for adults and are FREE for children (book here). The accompanying radio series can be found here. Tags: 15th century, 18th century, Albrecht Dührer, Berlin Wall, bible, books, Britain, British Museum, Carl Gustav Carus, Charlemagne, culture, empire, Ernst Barlach, exhibition reviews london, exhibitions london, France, Georgian, German, Germany, Germany British Museum exhibition review, Germany exhibition review, Germany Memories of a nation review, Gutenberg press, Hanover, Hitler, holocaust, Holy Roman Emperor, Holy Roman Empire, Johannes Gutenberg, king, language, latin, Maps, Martin Luther, Memories of a nation review, Napoleon, Nazi, Neil McGregor, Pope, porcelain, power, printing press, Prussia, reformation, Roman, science, scientist, ship, Spain, Thirty Years War, war, World War One, World War Two. Bookmark the permalink.